e-ACCES is an online resource collection that equips newcomer job seekers with information that can help them find meaningful work in Canada. The site is an international extension of ACCES Employment, a Toronto-based non-profit organization that campaigns for a fully inclusive labour force in Canada. e-ACCES helps job seekers to prepare for career success through webinars, articles, infographics and interactive material. Through these means, viewers find insight into workplace culture, job search strategies, job market trends, interview preparation, tips from hiring managers and more essential aspects to a Canadian job search. Available online for job seekers anywhere in the world, get started by visiting e-acces.accesemployment.org. 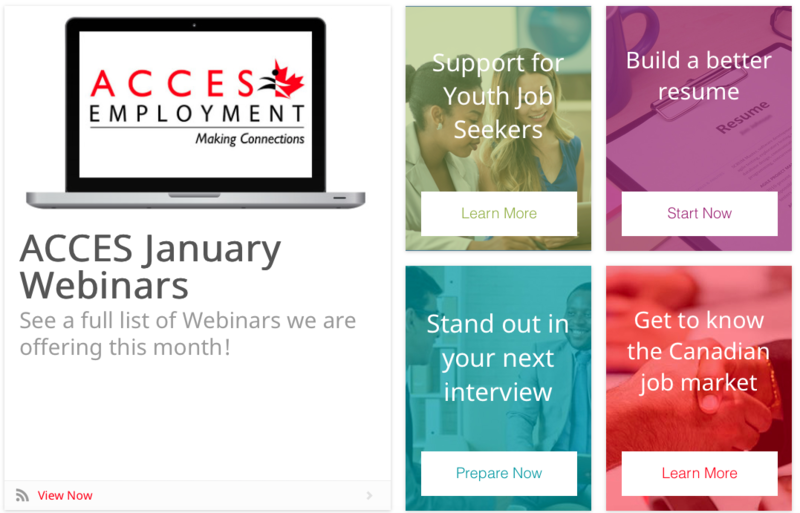 In addition to e-ACCES, live Employer Webinars and Online Workshops are hosted by ACCES Employment. These feature established professionals who cover topics such as in-demand jobs, how to impress hiring managers and how to make connections in your field. Webinars and workshops provide the support and assistance newcomers need in finding meaningful work in their field. All webinars and services are free of charge and open to all. Job seekers also have the opportunity to subscribe for regular email updates which provide job search tips and webinar invitations. For more information on ACCES’s new online services visit: accesemployment.ca/index.php/online-services.